Have you ever said, “Man, if I could only get some good attention or publicity, I could definitely sell my product?” If you have, you’re not alone. Truth be told, the hardest part about selling can be earning the attention of that prospective customer. That attention may not lead to instant conversion, but establishing an initial relationship is what might get them into your store, entice them to check out your website, or even earn you their email address or other contact information. That’s where social media proves invaluable these days. There is no easier, cheaper way to earn some publicity for your business – and who doesn’t need that? We get it; social media is exciting – especially if you’re establishing your business’s first Twitter account or FourSquare page. That said, don’t become the social media equivalent of a clingy first date – talking about wedding plans and baby names before you’ve ordered dessert. When you initially launch your social campaign, make sure that making introductions and building relationships is at the forefront of your motivations – not giving them the hard sell as soon as they’ve “liked” your page. Your mom was right – he that gives also receives. 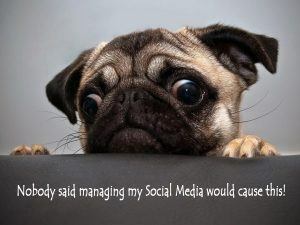 This concept is especially true when we’re talking about social media marketing. You now have the perfect venue to engage your customers and potential customers; now is the time to give them relevant content can help them to think of you as a subject matter expert or even their first resource when it comes to getting information about your industry. Remember when you defined your audience (along with their pain points) during your social media planning phase? Now is the time to use that research to develop the kinds of content (whitepapers, articles, links to trending news, etc.) from which your customers can really benefit. Your social media efforts may propel you to hundreds of contacts immediately, but it’s important to remember to avoid generalizations and canned introductions/responses when communicating with a customer or potential customer. If you’re building a network on LinkedIn, for example, you’d be much more successful using a personalized introduction and value proposition than by sending a quick “Let’s link up!” message. Your customers may have similar interests, concerns, and backgrounds, but they are still individuals and will respond more positively when they are treated as one. Thoughtful, personal responses to their posts, tweets, and messages will help you establish a relationship that can go beyond a computer screen – it may even help you develop a life-long customer! Do we even have to say it? Yes, we do. Too often, businesses are fearful of social media because they know it could potentially open their business up to public negativity. You may get a post or a message from a disgruntled customer for all to see. Well, don’t worry about that. Unsatisfied customers happen regardless of whether you have a social media strategy or not. The key is to be pleasant and positive at all times – that means not exacerbating a negative comment by responding negatively. In fact, this is your chance to convert an unsatisfied customer into a happy one. That also gives you the opportunity to show other customers and potential customers just how important it is to your business to provide the best service possible. Give it a Little Personality! Don’t be boring. Sure; sounds easy enough, right? Far too often, businesses are so worried about political correctness or possible offenses that they water down their messages to – well – boring. Now we’re not telling you to go out an offend people, but be sure that your posts and content let your personality shine through. Share articles that might be a tad on the controversial side (believe us, it’ll get your folks talking). Remember, when YOU show personality, your customers and potential customers are much more likely to remember your brand – and show you their personality! Sure, having a conversation on your Facebook page is great – especially if it’s giving other page members a good view of your business. But when you’re trying to convert a potential customer, you need to know when to take the conversation off the social space. For instance, if you’re looking to make an appointment, write a quote, or respond more thoroughly to a complaint, kindly offer to take the conversation on the phone or via email. The upside to this is that you’re developing a stronger and more personal connection with that customer – which can only mean good things for you! Remember, even though your end goal might be to sell, Social Media is about building relationships – so get talking – and the sales will come.